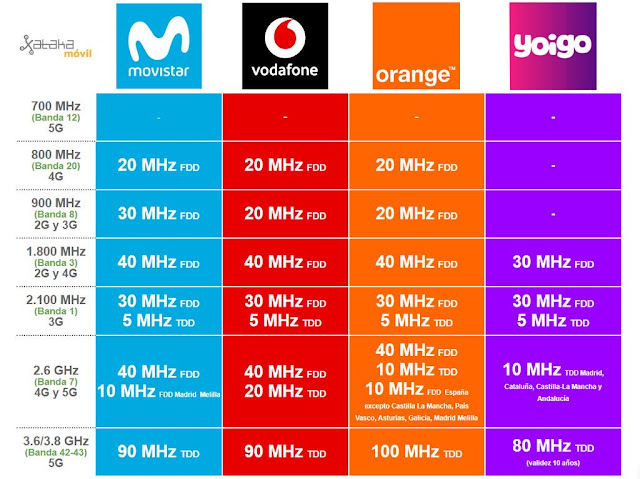 The above picture summarises the total amount of spectrum holding by all Spanish mobile network operators. Movistar is a major telecommunications brand owned by Telefónica, operating in Spain and in many Hispanic American countries. Yoigo, legally Xfera Móviles S.A., is the fourth largest mobile network operator in Spain, subsidiary of the Spanish telecommunications company Grupo MásMóvil. Analyst John Delaney notes that Spain's mobile operators paid €438 million for 200 MHz of 5G spectrum while in April, UK operators paid £1.15 billion for 150MHz.